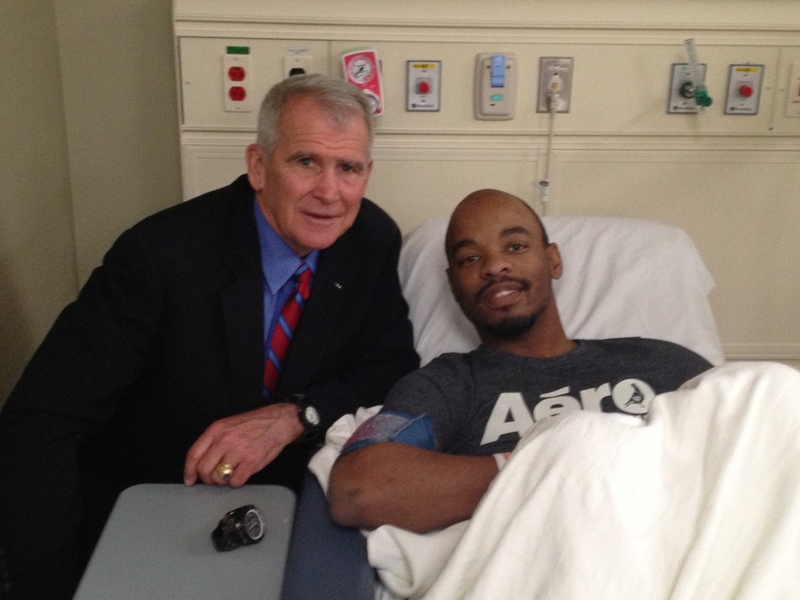 Lt. Col. Oliver North and his team from Freedom Alliance recently paid a visit to Walter Reed National Military Medical Center at Bethesda, Maryland. The Colonel’s intent was to spend a day with those heroes who are on the mend after sacrificing their health for our country’s defense. First stop was to call on the Navy Medicine National Capital Area commander, Admiral Alton L. Stocks, by way of his quarters in the main tower. The Admiral greeted the Colonel and, like a true doctor, sent us on our way with a verbal prescription for a long and healthy life. Then it was off to Building 62, where Staff Sergeant Paul Valentin, the protocol chief of the Marine detachment at Walter Reed, led Colonel North to a special section of the Warrior Cafe. Here the Colonel spent several hours catching up with old friends at the hospital and making new acquaintances—many of whom were young service members accompanied by their parents. First Lieutenant Nathan, also a double amputee, first met Colonel North at a dove hunt last summer while he was still restricted to his wheelchair. In the Warrior Cafe, however, he stood upright on prosthetic legs. This enthusiastic young Ranger platoon leader travels the world, following his desire for new experiences. After leaving the Warrior Cafe, the Colonel headed to Building 10 to offer support to several inpatient Marines and their families. One such Marine was Lance Corporal Mark, a grenadier. Mark stepped on an improvised explosive device (IED) while deployed in Afghanistan, which in turn detonated the grenade rounds in his belt. Since the amputation of both legs, extra bone has formed around his pelvis; currently he is recuperating from the surgery to remove that bone. An avid outdoorsman, Mark can’t wait to be discharged from inpatient so he can get back to his room in Building 62 and hopefully make it to a Freedom Alliance hunt. Colonel North ran into Lance Corporal David in the hall. David has been confined to the hospital for a month, receiving treatment for injuries sustained while trying to defuse a land mine. His wounds include burns to both arms, shrapnel lacerations, the loss of his left eye, and the amputation of his left arm above the wrist. “Are you right-handed, young man?” the Colonel asked him. “Yes, sir,” David responded. “Just before the device went off, I picked it up with my left hand and reached out away from my body as far as I could. We were trained to do this to save our good hand.” Knowing that the land mine was probably about to detonate, he resisted the urge to throw it, which would have set off additional mines and possibly killed other Marines. It was an honor to shake this brave warrior’s right hand before leaving Building 10 for the last stop of the day: the dialysis ward. 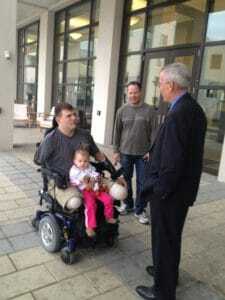 Taking time to meet with his injured comrades-in-arms is a commitment Colonel North makes a prime concern. Why is that? 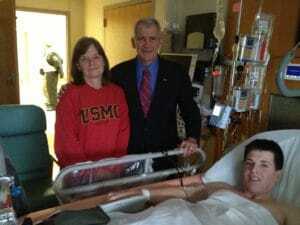 Well, until you see the smiles and gratitude of a recuperating soldier, you won’t understand how much it means to them to know that their fellow Marine—and a decorated officer at that—cares. Colonel North seems to know that it’s not conventional medicine, but it is a kind of healing that he can help facilitate, and it is rewarding for both the visitor and the patient.